WALLTITE® is applied directly to the breathable roofing membrane between timber rafters in tiled or slated pitched roofs. WALLTITE® has a measured water vapour permeability, therefore it does not compromise the performance of any breathable membrane, or the timbers to dry out when subjected to periods of solar radiation. The system minimises unwanted air leakage and air infiltration. Energy efficiency – the continuous spray leaves a minimal amount of surface area without insulation resulting in some cases, a 30% decrease in thermal transmission and an airtight building envelope of low permeability without the need for supplementary material. Sustainability – sustainable over the life span of the building, WALLTITE® can even prolong the buildings life as it protects against premature deterioration of building materials. Design freedom – WALLTITE® also provides the specifier with complete design freedom as the spray foam adapts to the shape of the substrate providing an ideal solution for insulating difficult areas such as profiled and curved roofs. The product is self-adhesive and stays fully bonded to the substrate, preventing any possible detachment, common with other types of insulation. Occupier comfort – for building occupiers, WALLTITE® makes a significant contribution to a comfortable indoor climate by creating a draft free environment that prevents the infiltration of pollutants, toxins and allergens. Reliability – WALLTITE® is only installed by trained professionals approved by BASF in the UK. Habitable space: plasterboard and skim/VCL with taped joints VCL to be carefully cut and sealed around struts, ceiling joists and penetrations); batten/counter batten rafters as necessary to achieve insulation depth, confirm rafter strength sufficient to receive counter battening and boarding if required. Loft space only, non habitable: insulated between and over rafters to achieve target U-value. WALLTITE® may remain exposed. WALLTITE® can be applied directly onto the underside of existing slate or tiled roofs. It seals any air gaps, preventing the ingress of windblown snow, rain, dust and unwanted air infiltration. The water vapour permeability of WALLTITE® permits all roof timbers to dry out following periods of solar radiation. 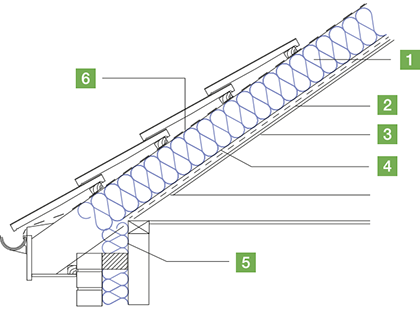 WALLTITE® is applied between rafters in sloping ceiling areas and loft conversions. Plasterboard can then be fixed to the rafters. In applications such as barn conversions the foam is dubbed out with a coat of bonding plaster and then finish plaster. Existing structures must be in a good state of repair with no evidence of rain penetration or damp. Defects should be made good prior to installing the product. WALLTITE® also reduces airborne noise pollution from air and road traffic. 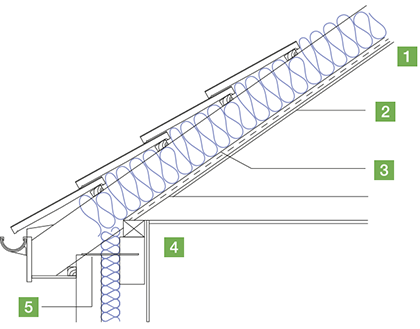 Loft space only, non habitable: insulated between and over rafters to achieve target U-value. WALLTITE® may remain exposed in a non-habitable loft space. Repair all roof defects and thoroughly overhaul where necessary prior to spraying.